PPP Chairman Bilawal Bhutto Zardari on Saturday nominated Murad Ali Shah for the Sindh chief minister's job and Agha Siraj Durrani for the Speaker's role, according to a party spokesperson. The decision was taken at a party meeting where former president Asif Ali Zardari and several other senior party leaders were also present. Bilawal told the newly-elected MPAs that "people have high expectations" of them, and asked the parliamentary party to "forget the last 10 years and get ready for a more transparent and merit-based style of governance". The PPP chairman warned that "there will be no life-time ministers or chief ministers as he himself will be monitoring the performance of all, including MPAs." With PPP having bagged an overwhelming majority in Sindh in the July 25 polls, both Shah and Durrani could be set to reprise the roles they also had in the previous provincial government. Meanwhile, the party's choice for the Sindh Assembly's deputy speaker is Rehana Leghari. Shah had first taken up the top ministerial job in Sindh on July 29, 2016 when he was chosen by PPP as Qaim Ali Shah's successor. He also had little trouble fending off Pakistan Tehreek-i-Insaf's Khurram Sher Zaman in the provincial legislature's voting session, as he had secured 88 votes as compared to the opposition candidate's three. While the overall number of PPP's seats in the Sindh assembly has gone down from 91 in 2013 to 74 this time around, it is still likely to be enough for Shah and Durrani to secure another term in the office. They failed to make a difference in their previous roles. Now they will continue business as usual, from the Air Conditioned offices, never ever meeting a single person of the public or visting any locals. That's how ineffective they have been over the past 5 years, Don't expect miracles this time. Another period of 5 years of darkness is knocking at the door. And, no one is listening. Wow! What an progressive change!! Both the gentlemen have previous experience, except some land scam news about Agha Sahab, otherwise OK. I wish all the best for PPP and hope this time they will deliver. PPP Chairman Bilawal Bhutto Zardari should take a job as Sindh Chief Minister get some experience what it takes to run a province; instead of living on stolen money from his grand father, mother and father. So Murad Shah will have another four years to make a hash of Sindh. The Prince has spoken, let it be done. The PPP has absolute majority to form Government in Sindh. Therefore, it would be nice to give key important portfolio ministries to urdu speaking jialas of PPP in order to remove the misconception that PPP represents interior Sindh, therefore, it has no concern whatsoever with the development of Karachi. In the best interest of harmony and peace in Sindh, some of the key ministries, such as education, health, finance may be shared with Karachities. Going one step further, the time has now come, PPP must take bold decision to end quota in Sindh and let there is be only one and sole criteria of MERIT for recruitment and admissions in the Sindh Departments and Institutions. People deserve same by selecting same. Agha Siraj Durrani. His time for accountability is not very far. Murad Ali Shah was not able to deliver before and he will not be able to do it again. The king of corruption has guided well his prince to choose. @Jalbani Baloch ... absolutely! I'm a Sindhi speaking from rural Sindh, and I am against quota system. The quota system is a poison, same as treaty Indians privileges in USA and Canada. It takes away the passion for competition from rural sindhis. Merit based system should be introduced where rural and urban sindhis not only get admissions to educational institutions and jobs based upon merit, but also they should work proportionately in rural Sindh. Unfortunately Interior Sind will never change and poor villagers will remain under the thumbs of looters. Badd day for Karachi and sindh. They did nothing for sindh. Lets wait and see what difference does BBZ makes and what goods comes out with his leadership. The general perception is no goodness can be expected from this bunch of criminals. @saksci - The grandfather misused the power, but did not steal. Only the mother and father are guilty of misappropriation of public funds. 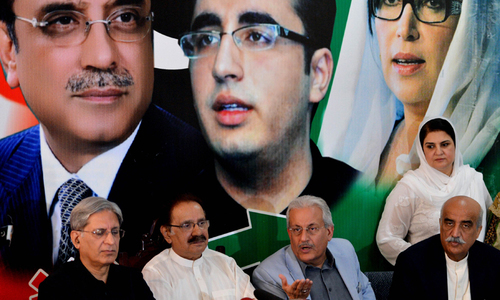 @saksci - for Bilawal to take the office of Chief Minister could be political suicide. Now he can deflect the blame holding others responsible for the failure. Should he become CM and fail, it would be the end of his dreams of becoming PM of the country. This time they will deliver? to Prince (Mr. Bilawal Zardari). Queen (Ms.
Benazir Zardari) is not present. PPP was not credited for its contribution of development works in Khi, in the period of Murad Ali Shah. One should give him fair credit for his two year term in which he has revamped khi. A dozen projects of infrastructure development were launched and completed in his term. Much needs to be done, in his next term he os going to do much projects and revamp khi since the mayor doesn't take his role, seriously. KMC has been minting huge amounts of money every month from Sindh Govt and not undertaking any development at all. All its revenue goes in pocket of Mayor and all expenses are paid by Sindh Govt. listen to the hypocrisy of the merit-based performance language, copied from the PTI playbook. zardari means more corruption and no contribution by governance. Zardari has basically ruined PPP, Maybe PPP has a chance if Bilawal will lead the party. But Bilawal has much to learn, so far the only reason he gets to lead PPP is because of his Grandfather and mother's names. Lack of education, feudalism, PPP, we have to suffer another 5 years. Same old same old. Poor people of sindh.